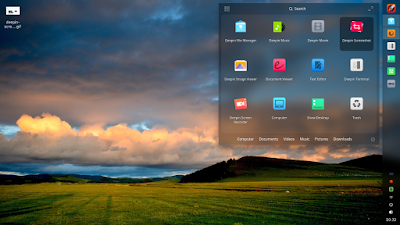 Do you know that you can enjoy Deepin Desktop not only at Deepin GNU/Linux? 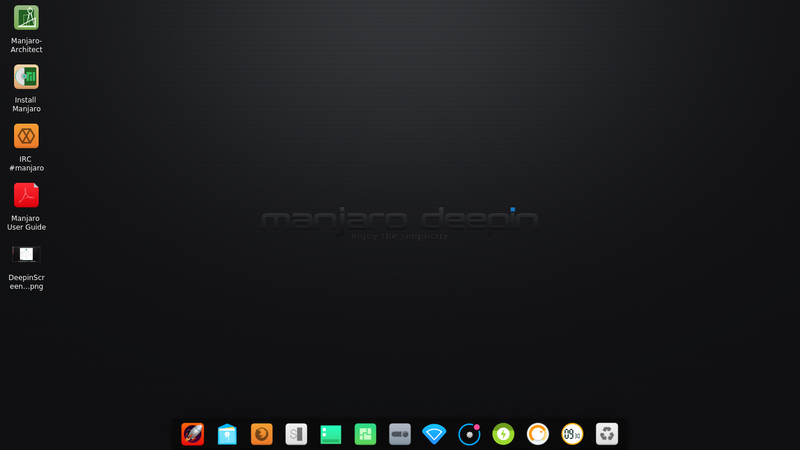 For now, Manjaro OS has a community edition called Manjaro Deepin. 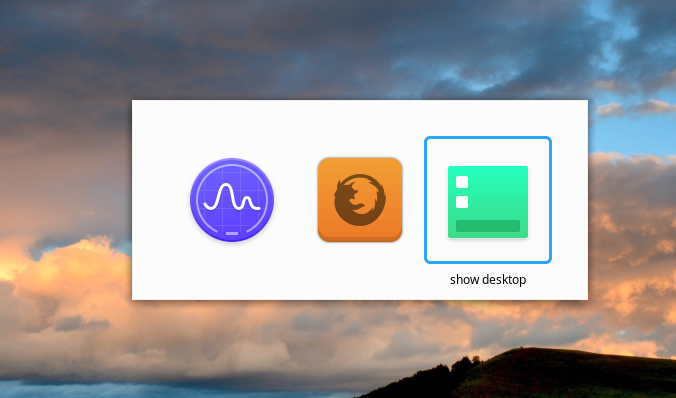 Yes, this means an OS with always latest packages and with Deepin Desktop! I find latest Deepin Desktop is far more lightweight at Manjaro than at Deepin OS 15.4.1. The 3D desktop effect is pretty normal there, not consuming 100% of CPU like my latest review on 15.4.1. 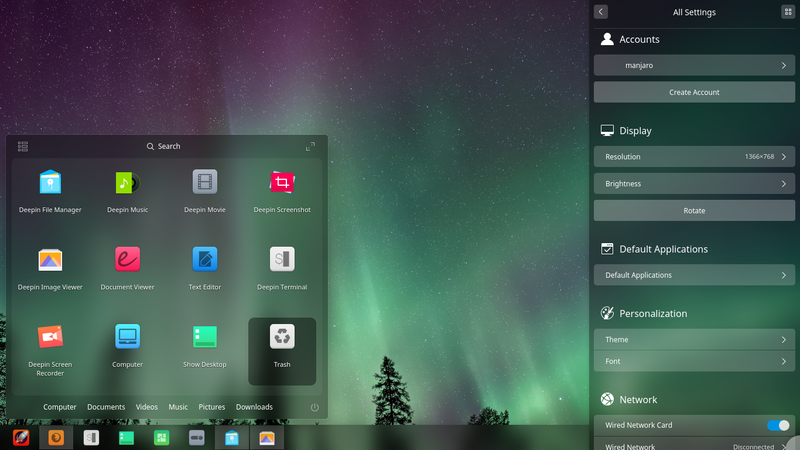 I recommend anyone to test Manjaro Deepin instead if he/she needs to see how amazing Deepin Desktop is. Now it's time for the quick look! Manjaro Torrents project is maintained by costgranda and strit83 (big thanks to you! ), Manjaro Linux Community project is maintained by oberon2007 and philmmanjaro (big thanks!). 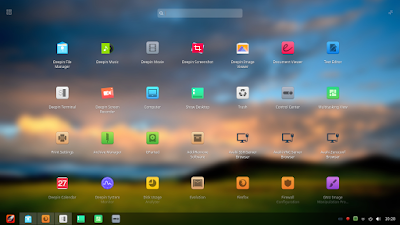 This is the default view on Manjaro Deepin 17.0.2 system. The user interface is Deepin Desktop 15.4.1. That's the same desktop as in deepin GNU/Linux 15.4.1. Do you like bottom-left menu at bottom panel? 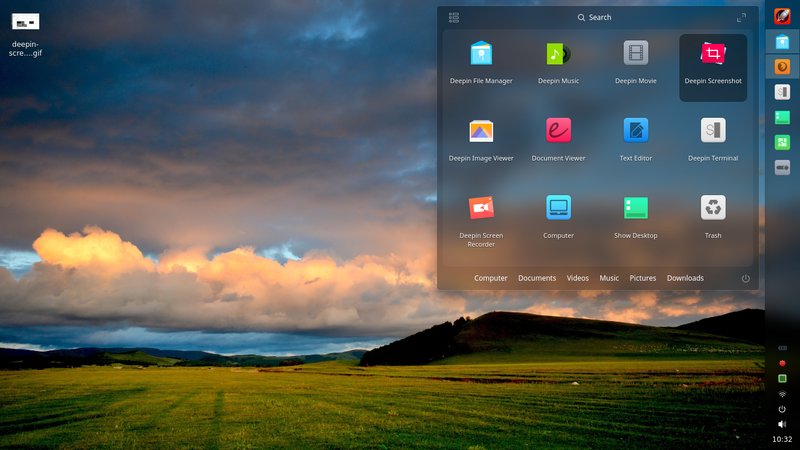 If you do, you'll like Deepin Desktop 15.4.1. You can switch between menu modes Full-Screen and Classic-Bottom easily by pressing diagonal arrow at top-right corner. Combining Classic Menu with Efficient Mode panel gives you Windows-like feel (yes, the same feel as KDE Plasma or Cinnamon). The full screen menu is the default with mobile-oriented style. The icons are arranged in Center with translucency on the background. When you click on an icon, it waves as a sign you're running a program. The panel is now can be placed on 4 places, including left edge, and vertically like Unity Launcher. Even, you can place it at right edge of screen if you wish. 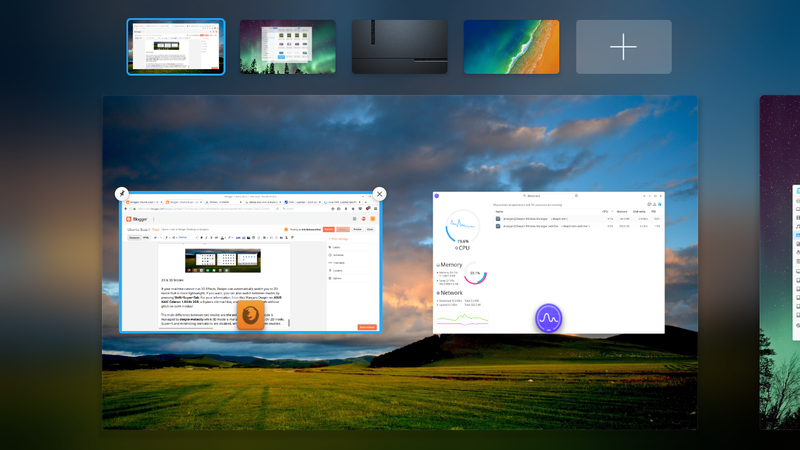 Deepin Control Center, or simply its right-edge sidebar, is visually more appealing with nice translucency and clean design. This means all settings for the system are done in this sidebar, not in any separate window like Ubuntu System Settings. You push your cursor to bottom-right corner to reveal it. 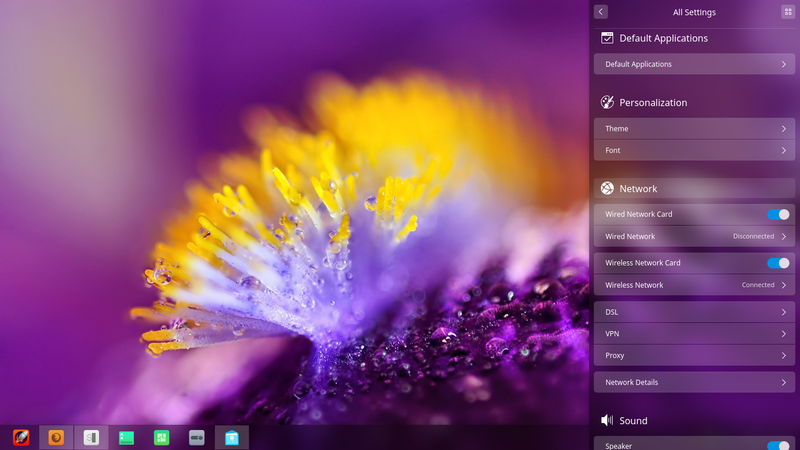 This is the amazing Deepin System Monitor v1.0! How glad I'm as GNU/Linux user, to see a fancy "Task Manager" like this. It's unique compared to KDE KSysGuard or GNOME System Monitor, when it has CPU+RAM+Net graphs and Process Table displayed on the same window. Have a closer look, it includes Download/Upload Speed columns as well at the table! And you may see the CPU consumption difference here. 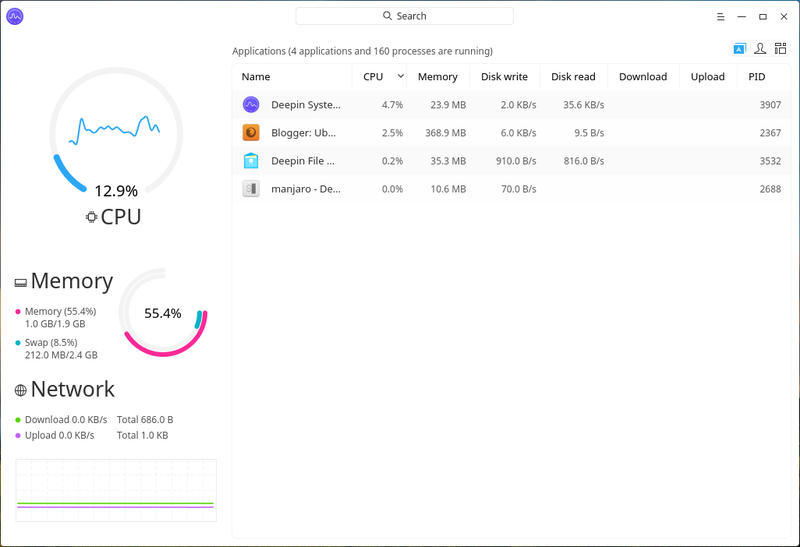 See, below is Deepin Desktop on Manjaro 17.0.2, the deepin-wm consumes normal CPU resources (below 5%). 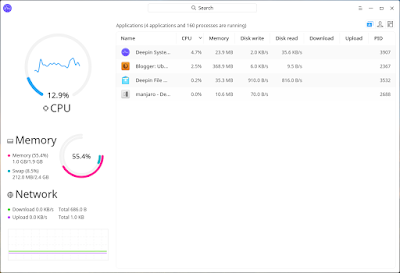 Compare it to Deepin on deepin OS 15.4.1, when deepin-wm consumes 100% CPU constantly. I hope this problem be fixed soon on deepin OS! 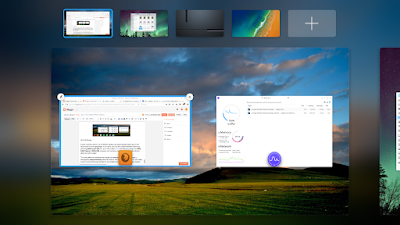 The window switcher is displayed in elegant way with its translucency and animation. When you hover the cursor on a running program, it shows the tooltip preview with animation activating the window when you move the cursor. It also features CLOSE (X) button on every window being previewed. If your machine cannot run 3D Effects, Deepin 15.4.1 can automatically switch you to 2D mode that is more lightweight. If you want, you can also switch between modes by pressing Shift+Super+Tab. The 2D mode is friendly for old computers with low-specification. For your information, I run this Manjaro Deepin on ASUS X44C Celeron 1.8GHz 2GB, a 6-years old machine, and it runs very smooth without glitch on both modes! The main difference between two modes are the animations. The 2D mode is managed by deepin-metacity while 3D mode is managed by deepin-wm. On 2D mode, Super+S and minimizing animations are disabled, while 3D mode has them enabled. 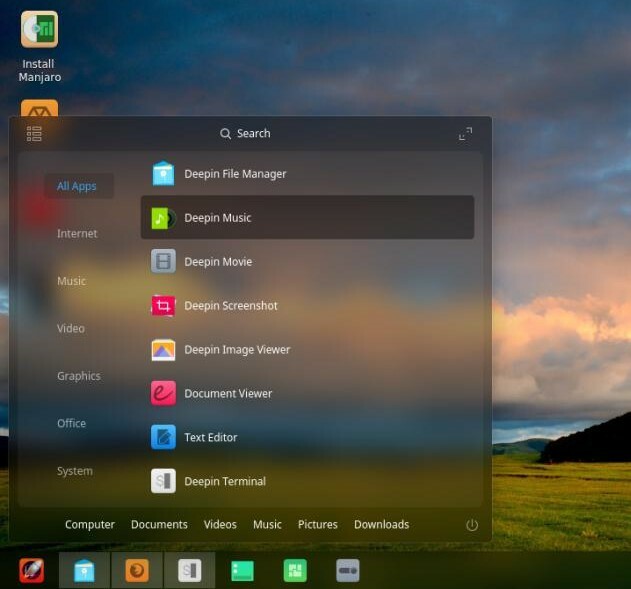 If you want to test latest Deepin Desktop, especially on old machines, go for Manjaro Deepin. From my sessions with it, it's very pleasant to have an aesthetic, modern-looking desktop runs so smoothly on my old laptop! However, I'm also waiting for any new Ubuntu Deepin flavour. 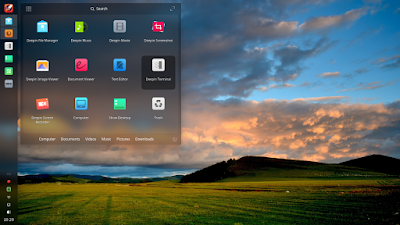 And finally, I hope this review helps you to know Deepin Desktop at its best! Enjoy.